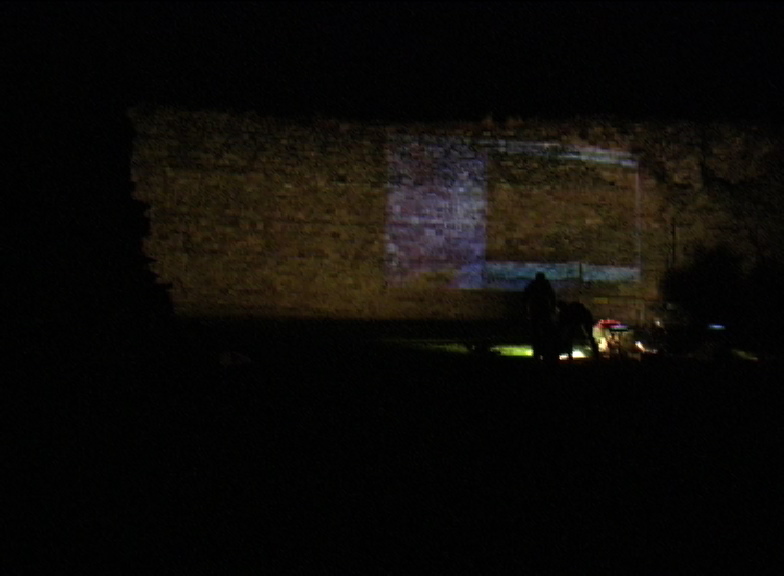 The Ruin was a site responsive video installation, which was shown in the Rothesay Castle on the Isle of Bute in Scotland. 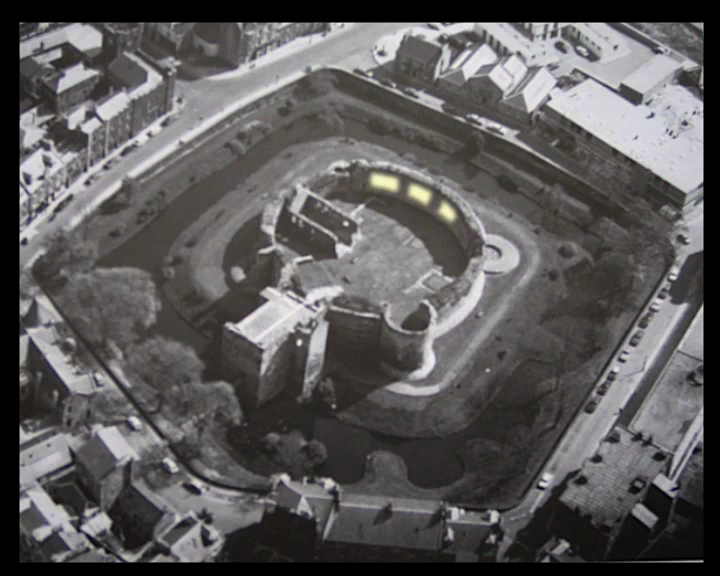 The black and white image below is an old aerial shot of the castle (light patches indicate location of the video projections). This work approached the monumental, circular ruin as a body, as a container of memory, and looked to its materiality for a way into the political narratives embedded in the stones, water and dirt. The public event was not recorded but a description can be found below these images. 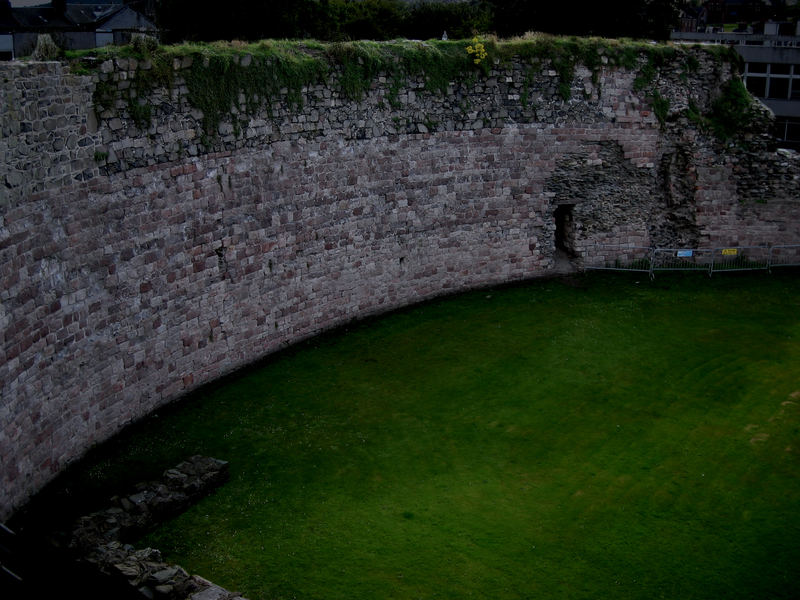 Rothesay castle is ancient but was rebuilt in the 14th century by the Stuart (from the word steward) family. The castle and the ‘Historic Scotland’ signage which surrounds it are all signifiers of official history (Jackson, 2003). The building was originally constructed to protect the ruling class and is now managed by government and councils who protect and maintain official history. In this work the representative body (edifice) of those who write history is contrasted and made to cohabit with unofficial history, or untrustworthy, ‘variable’ histories (and bodies). (Folk songs: Jackson 2005, Authenticity: Hesford 2004). The Stuart’s family company still own almost the entire island and large parts of Scotland and Wales. Most of their money was made from the slave trade or more specifically its ‘associated’ industries and from taxing the ships of coal coming in and out of the docks they owned in Cardiff . The research process looked to the edifice through folk stories and songs (unofficial histories) for traces of the bodies inextricably linked to its existence. These bodies are physically part of the matter and materiality of the space, but through language (and therefore power), have been invisiblised. I was not interested in the notorious violent history of the site and the ruin, so much as the violence of how empirical history is mediated and maintained. It was an opportunity to work with a site which has narratives that have always been overtly choreographed to protect power (currently through maintenance of official history). The castle aside, its mediation has been part of a labyrinth of dominant narratives that ensure systemic violence – in particular, racism and poverty . In the gaps of these narratives are the stories of people who are spoken out of history. The edifice is built with thousands of cut stones. Human hands laid these stones, and human bodies paid for these stones; or more specifically, the stones were paid for with bodies; miner’s bodies, many of whom died young of black lung . And so, to illuminate these bodies’ relationship to the stones, I made work hoping it would operate as the hacking dusty lungs of the edifice. 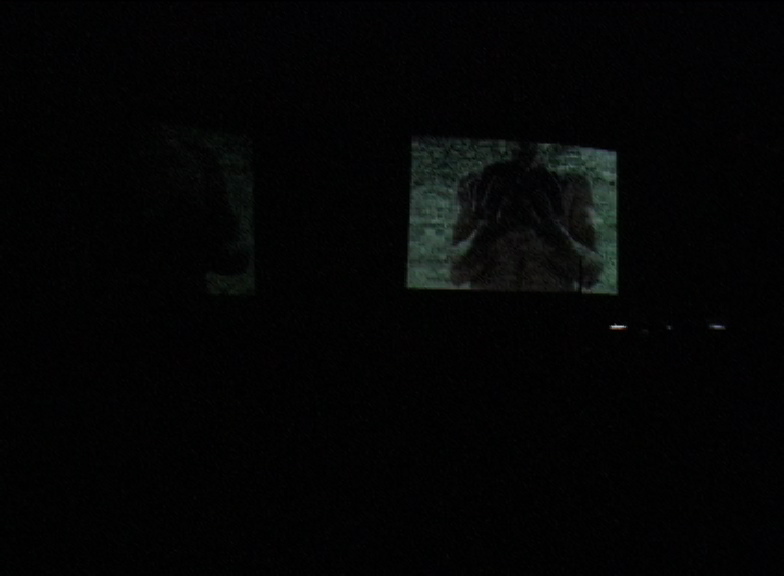 The work was a series of three simultaneous projections (refer to image at the top) wrapped around the inside of the circular walls. 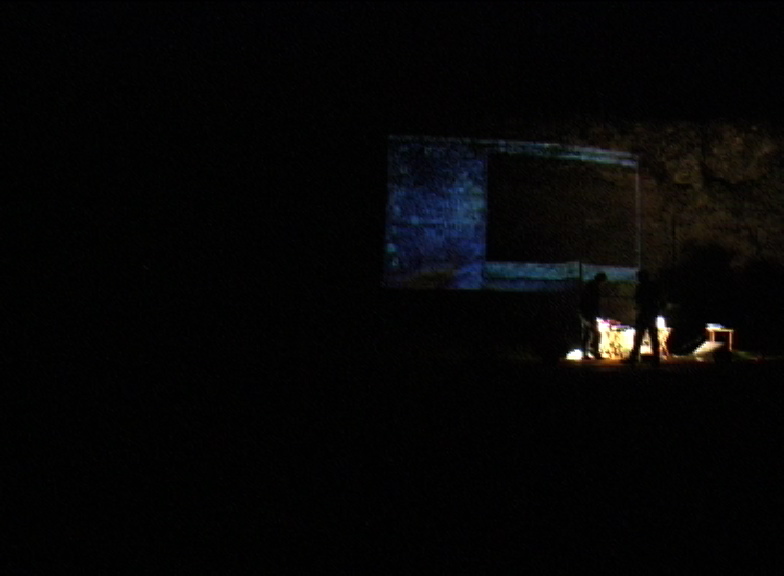 On entering the ruin, the viewer faced in the darkness the backs, shoulders and heads of three men, all facing away. 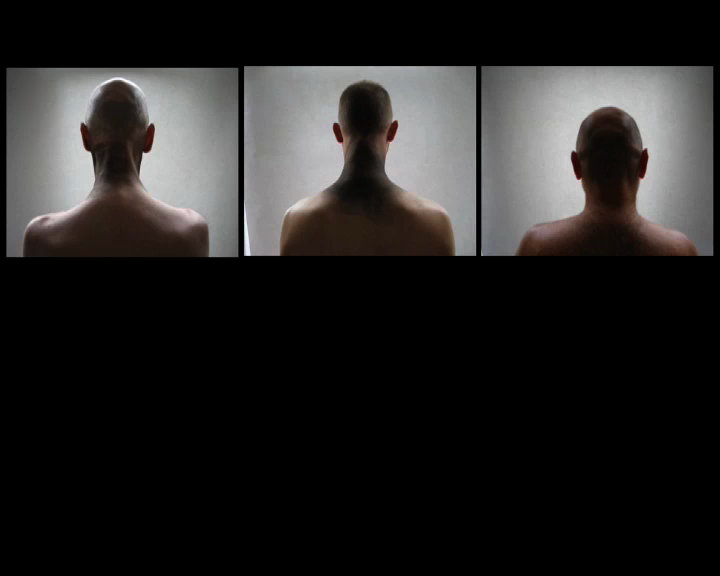 The images are gentle, there are no clothing markers on the bodies and they face outward, as if protecting the viewers. They are keeping watch. They are almost god-sized. 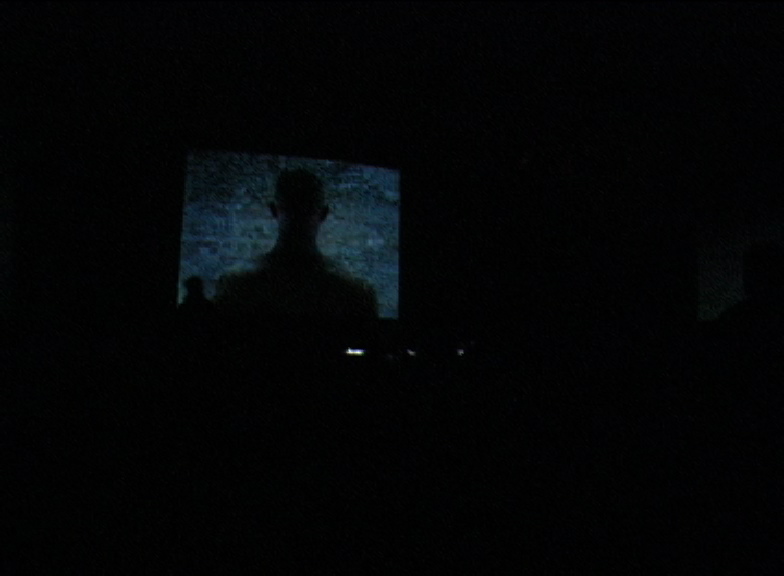 The images are still but as the people (audience) have filed into the openair castle, the bodies begin to breathe. Shoulders moving up and down in time with a comfortable and regular breath. The choreography then changes. The men turn and look inward. They are no longer keeping watch for those of us in the castle; suddenly we are surrounded. The shift was slight but in a moment we have become implicated . It is now about the space inside, where we stand. We can’t see the faces of the men but their chests and throats line the walls surrounding us. 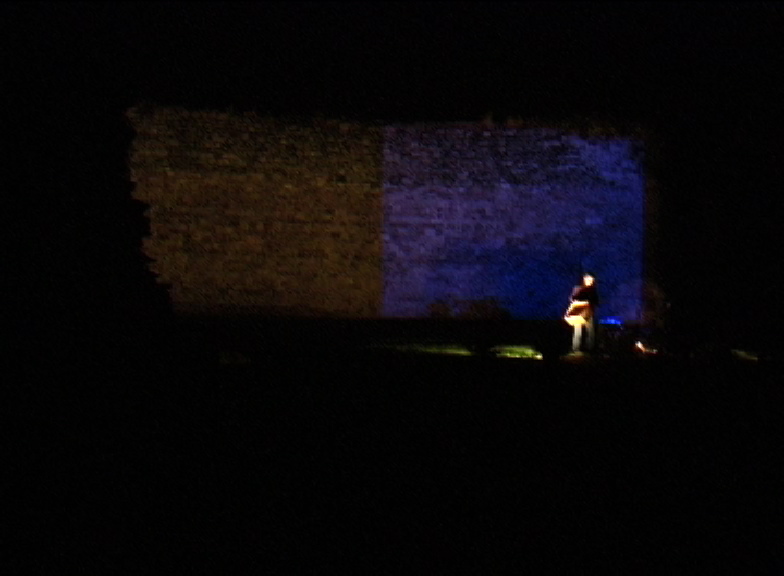 Its dusk and the little light there is left plays tricks on the stones. Eventually, the men start to cough a little and before long the images start to break up. Their images become intermittent, flashing like shots of memory as they hack up the dust in their lungs, heaving. Suddenly the images contract, leaving only their throats, wrapping around the walls like a long text, like a script, a scroll. A linear narrative coiled around the buildings insides. On the scroll the throats are heaving, slowly, haunting and gasping for breath. The audio becomes disconcerting, guttural, at times they sound animal. The sound is now like wheezing. 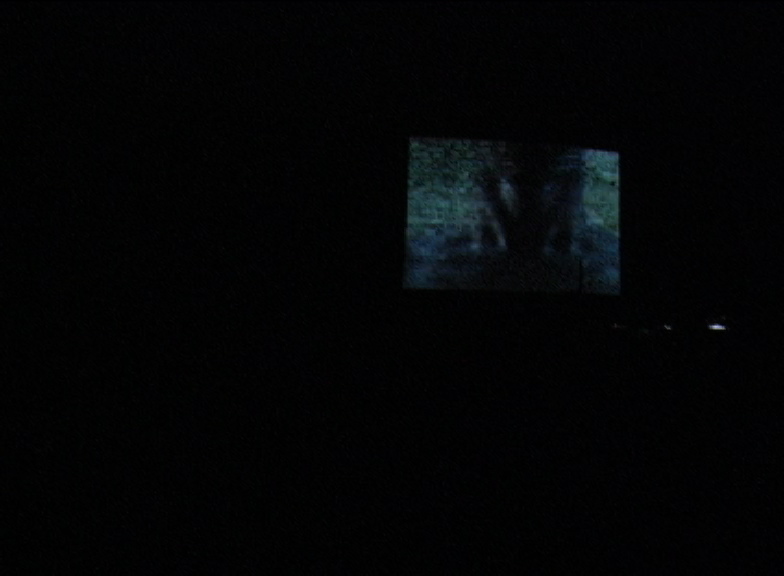 Technically it is sound left from the original film, slowed down so far like a chewing tape. It references narratives dissolving, “history being chewed into a continuous present” (Smith, 2002, p.215) After some time, it becomes about endurance, so there is time to think about the place we are, remember the spot we stand in and notice dusk has fallen and the sky is thick with stars. This theatre is ancient. The night is gentle and all the time we can smell the familiar scent of the moat surrounding us. We are not going anywhere, the time is not rushed. This is the ultimate empirical island, its borders protected by water. And we are inside. The throats continue heaving as their bodies contest the heroic and noble narratives of the site. Eventually over the heartbeat which has throbbed – the only constant throughout – a woman’s voice rises. The hairs on our necks prickle and still images of the men relax, like epitaphs. They stand with their offerings, black gold on their marked bodies. They hold for a short while then fade like ghosts back into the stones. After this ritual they will always be there. Spoken back into the space. Their images fade and the protest song rings through the air, unofficial history and the woman’s voice milking the night, taking up space that every other day of the week they are spoken out of. We all stand silent like we are at some kind of memorial service, or we are waiting to be rallied together to fight, and I can hear sobs quietly as folk remember, through their own bodies and families. Eventually the song ends and we all stand in silence. It is some time before anyone speaks, and even then, it seems no one really wants to. Eventually people start to talk. Everyone has a history with these bodies or the bodies that were cast to stand in for, and for a moment, everybody re-members and we speak these histories into being.